I have just given you the secret to your Carpet Buying success. It's easy and it works. Some people want to do things their own way. 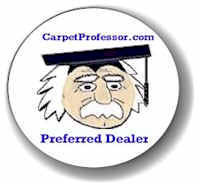 Some people think they know enough to buy carpet after reading a few of my free articles and Q & A pages. Some people like to learn things the hard way. Is your Carpet Installer Licensed, Bonded & Insured? Check Now to see if you carpet or flooring installer is subject to your State Licensing Regulations. You should always call to make sure who you hire is properly licensed, bonded and insured according to the State and Local Laws where you live. You can also check to see if there have been any prior complaints filed against the contractor in question. Take a look at my special list of locally owned and preferred carpet dealers across America. I have over 400 listed so far. They are all hand-picked by me personally one at a time. They must meet my requirements, standards and guidelines before I will list them in my directory. No matter what, you need to buy from a reputable carpet dealer!